SPECTACULAR large Beachfront 2BR/ 2 bath Condo in Bucerias - Outstanding Rates . Comes equipped with everything required for a fabulous relaxing holiday! condo overlooks infinity pool and beach. Walking distance to everything Bucerias has to offer! Best complex on the beach in Bucerias! Welcome to the best resort in Bucerias! This one of a kind new upscale beachfront condominium is located in Bucerias, a quaint beachside town situated right outside of Nuevo Vallarta. This upscale condo boasts two large bedrooms both with full size bathrooms, marble floors, granite counters, stainless steel appliances, 40 ft. long deck with endless ocean views- there is nothing between you and the beach! All rooms are air-conditioned and are professionally and tastefully decorated with a Mexican flare. The kitchen is fully stocked with dishes, utensils and small appliances. A large flat screen TV is in the living room equipped with DVD player and Star Choice Satellite. A stereo unit is also provided which plays iPods. Bring your iPod, plug it in and enjoy your own music. A safe is provided to lock up your valuables. High speed wireless internet is available for your convenience. Glass doors onto the terrace open up wall to wall to allow the terrace and the marvelous views to become part of your living/dining room area. The perfect area for relaxing in the sun, watching the dolphins, reading, experiencing the view or sipping on a drink. Enjoy the warm night breezes and watch the fabulous sunsets! This beachfront condo complex has 30 units. There is 24 hr security, a large infinity pool overlooking the ocean, BBQ area and full gym with equipment and exercise area. One parking stall is provided. Elevator is steps from the condo door. Book an insuite massage. The beautiful beach is right at your doorstep! Miles of expansive sand along Banderas Bay are steps away to enjoy. Walk, stroll, run, boogie board, surf, kayak, dolphin watch – the activities are endless. The old world charm of Buecerias is all around to savor and take in. Stroll the cobble stone streets, visit the local market next door to explore and shop for hand crafted jewelry, pottery, clothing, souvenirs and food. Try the many fine restaurants. Airport transportation to our condo can be arranged. Our property manager will contact you prior to your arrival and will be there to greet you when you arrive at our condo and will do everything she can in assisting to make your visit to Bucerias and stay at our condo unforgettable! A binder providing information on restaurants, shopping, car rentals and other activities is there to further help you find your way around. Downtown Puerto Vallarta is 15 mins. away. 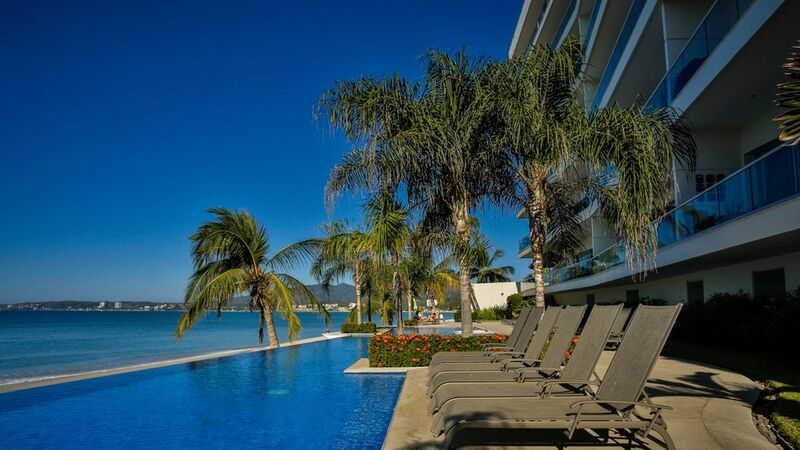 Enjoy your stay at this fabulous Bucerias Resort. Your trip to Bucerias and your stay in our condo will be memorable! Come and share the unforgettable experience. A 50% deposit is required to hold booking. A $500.00 security deposit is required with 2nd payment. It will promptly be refunded after property manager has notified us of your checkout. Maximum of 4 guests - strictly enforced. Bucerias is a great spot. Quiet and authentic. This unique luxurious condo with high end finishing and breath taking views. We loved the fact that it is beachfront and close to everything. We wanted a place in the sun where we could spend quality time once we retire. Our condo has everything you need: gym, pool, beach and sunshine. Great restaurants close by, golf and the old town charm of Bucerias. Miles and miles of sandy beach and incredible views. What more could one ask for! It's our home away from home. fronts 14 miles of sandy beach along Banderas Bay. Best location in Bucerias. gym overlooking pool and beach. The condo was everything we hoped it would be. The unit was roomy,clean and well air conditioned(4 units). It had all the little things you hope for but usually need to get yourself. Like salt and pepper,coffee spices,cooking oil etc. The view was great and the pool fantastic. The ocean beat me up several times but that’s just me. We will definitely be back. Condo was clean and well stocked. Beds were very comfortable and made our stay much more enjoyable. No more resorts for us we will continue to return to this area and complex because of all the fine dining and activities that are within walking distance. The complex is very well maintained and security and property management is always available should you need anything or have any questions. The view from the balcony is one of the best in the evening at sunset. The pool is just enough size. and availability, and the beach is even well-groomed! Exactly what we wanted! What an amazing place to stay, wake up early in the morning sipping your coffee and watch the dolphins. I would highly recommend. The pool is lovely and never busy. Thanks for allowing us to stay. Wonderful family vaca in Bucerias!!! Wonderful condo and complex. Libby and Teresa worked together well and made sure we had everything we needed. The location could not have been any better, within walking distance to many restaurants, a short distance from the airport and other areas to adventure out to. The pool was wonderful and others in the complex, owners/renters, were all very hospitable. The condo was comfortable had just about anything we could have needed. The security guard at night was always pleasant to talk with and very helpful with any questions. Thank you. Perfect Property in the perfect location! 4 of us spent 10 wonderful days and it was perfect. All transactions were very smooth, lodging was the best in Bucerias and we can't wait to go back. I would recommend this to anyone, everything was perfect. Monthly rates available. Contact Owner for details Deposit and balance are non-refundable unless all nights can be re-booked minus a $500.00 booking charge The maximum number of people is 4. This is strictly enforced and the security deposit will not be returned.